At the Paris Motor Show 2016 will take place the premiere of the updated SUV 2017 Suzuki SX4 in a new body, which in some markets is known as the S-Cross. Official photos and details about the model manufacturer has already distributed in July. Outside, the new 2017 Suzuki SX4 hardest changed front. The car was modified bumper, head optics and other rather unusual chrome grille with vertical ribs. Only a small rear lights have undergone revision. Inside, a little improved finishing materials, plus there are several additional options for interior design. The steering wheel and instrument cluster are the same, but in the new equipment came multimedia system with 7.0-inch display, as well as support Apple CarPlay and function MirrorLink. Only the most attentive will pay attention to the other selector transmission. With regard to technology, the new 2017 Suzuki SX4 lost the 1.6-liter 120 hp aspirated. From now on only available for crossover turbocharged engines family Boosterjet working volume of 1.0 (112 hp and 170 Nm) and 1.4 (140 hp and 220 Nm) a liter - the same are available for the platform of Suzuki Vitara. Four-wheel drive only put more powerful engines, and they are combined in a pair with a six-speed mechanics or automatic. In some countries, Suzuki S-Cross 2017 is also available with DDiS diesel engine a 1.6-liter with 120 hp (320 Nm). 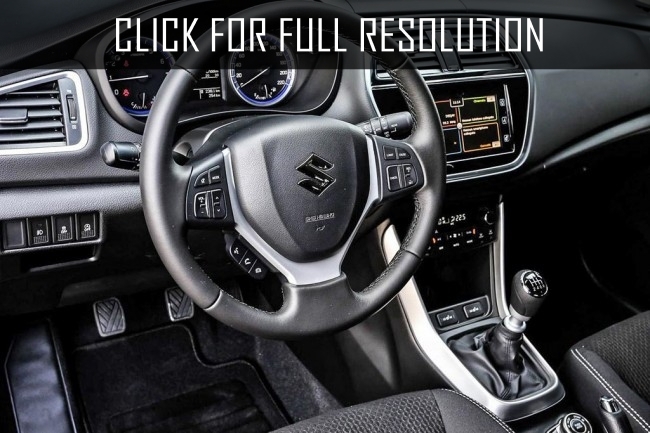 Generally, the pre-reform version of the model, we have ceased to supply back in 2015, but the updated 2017 Suzuki SX4 promises to start selling in the autumn of 2016, prices and equipment are to be announced on 30 September.